House members make their case over the confirmation of Sharon Jackson to Lt. Gov. Kevin Meyer on Jan. 15, 2019. (Gavel Alaska). Update: The House returned at 5 p.m.—after huddling in caucus and meeting with legal advice—and promptly gaveled out for the day. It’ll be back in session Wednesday at 1 p.m. The House has not yet seated House District 13 nominee Sharon Jackson amid a procedural battle between party-line Republicans and the remnants of the previous House Majority Coalition. 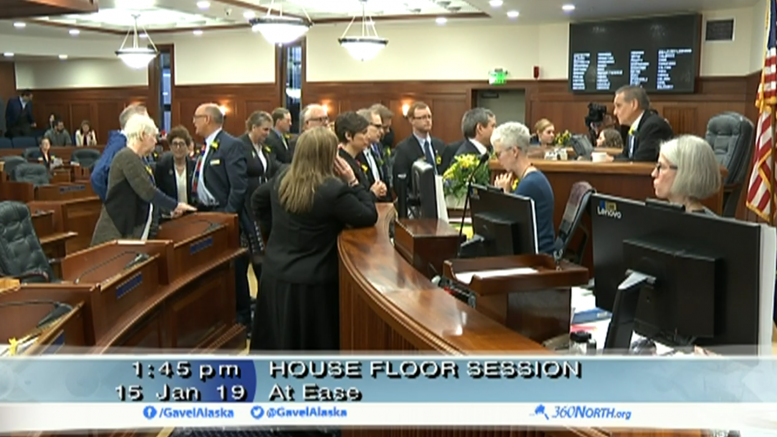 Jackson had to sit out during the swearing in of members who made it to Juneau via election, and if House Democrats get their way she’ll have to sit on the sidelines until a temporary House speaker is selected (a proposition that could take days or weeks given the overall impasse in the chamber). The basis of the argument is whether or not Lt. Gov. Kevin Meyer effectively has the power to seat appointed members. After the swearing in of elected members, Meyer (who presides over each body until they get underway with selecting a presiding officer) moved to accept a letter from Gov. Michael J. Dunleavy outlining his nomination of Jackson to fill a position vacated by Nancy Dahlstrom, who took a job with the administration after winning election. This process is outlined in the Alaska Constitution, requiring House members of her party—the Alaska Republican Party—to approve her appointment. His move was met with an objection by Anchorage Democratic Rep. Chris Tuck, who served as the majority leader under the previous House Majority Coalition, making reality the swirling rumors of a confirmation fight. The possibility of the fight emerged last week with the thinking that Jackson’s confirmation can only take place once the chamber can officially receive communications from the governor, a process with requires at the very least a temporary presiding officer (a speaker pro tem). The Legislature’s uniform rules are silent on the matter, but it does outline that it’s elected members who take part in the selection of a speaker and speaker pro tem. Meyer, who’s acknowledged his very limited power to conduct House business, argued in favor of seating Jackson. He noted that the letter was addressed to House Republicans, not the House itself. Tuck refused to relent, which resulted in a lengthy at-ease filled with huddles and direct appeals to Meyer. The confirmation of Jackson to the House is set against the backdrop of a gridlock in the House as each side—party-line Republicans and everyone else—attempts to cobble together a 21-member majority and select a speaker. Jackson would bring the party-line Republicans’ numbers to 20 with no clear path to the 21st vote as the moderates from the former House Majority Coalition have pledged to stick together and Republican Rep. Gary Knopp withdrew his support for the party-line Republican majority in hopes of forming an evenly bipartisan coalition. Eventually, Meyer returned from the at-ease to announce that there would be no action take on the letter for the time being. The House is set to return at 5 p.m. The Senate met at 11 a.m. and selected its presiding officer, Senate President Cathy Giessel, without problem. Be the first to comment on "House nominee Sharon Jackson not yet seated as legislators argue over procedure"